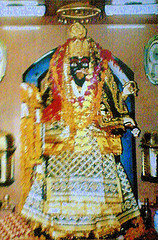 Shri Kali Mata Temple is situated opposite Baradari garden on the Mall Road of Patiala City (Punjab). This Temple was built by the Sikh ruler of the Patiala State Maharaja Bhupinder Singh who financed the building in his capital of the Mata Kali Devi Temple and oversaw the installation there, in 1936. Bhupinder Singh was the ruling Maharaja of the princely state of Patiala from 1900 to 1938. He was inspired to build this temple and bring the 6-ft statue of Divine Mother Kali & Paawan Jyoti from Bengal to Patiala & he offered “First Bali” (sacrifice) of a water buffalo to the temple of Kali in Patiala. Because of Temple’s beautiful infrastructure, it has been declared a national monument. This large complex attracts devotees, Hindu and Sikh, from distant places. A much older temple of Raj Rajeshwari is also situated in the center of this complex. Devotees offer Mustard Oil, daal (lentils), sweets, coconuts, bangles and chunnis, goats, hens and liquor to the Divine Mother here. Who can comprehend the Divine paradox of Mother Kali? Fierce, black in color large, shimmering eyes, destructive, triumphantly smiling amidst the slaughter of billions of demons, wearing a necklace of skulls and a skirt of severed arms, glowing effulgently like the full moon in the night sky, holding the head of a demon, a Trident that flashes like lightning and a Knife etched with sacred mantras and infused with Divine Shakti, Kali stands serene and pleased, suffused with the fragrances of jasmine, rose and sandlewood! Mother Kali is a Guardian, also known as The Protectress. Mother Kali is Dharma in Eternal Time. Kali shines with the brilliance of a Million Black Fires of Dissolution and her body is bathed in vibuthi (sacred ash). Shiva is under Her Feet and the Great Devotee, Ramprased, envisioned Kali as stepping upon a demon that was transformed, by Kali’s touch, into Lord Shiva Himself! Just as the night sky appears black and the ocean appears deep blue due to its fathomless depth, so too kali appears dark due to great powers and depth. Kali assumes the form that reflects the attitude and emotion of the person who approaches her only if Kali is approached with pure emotion of Motherly Love. Patiala is one of the famous cities of Punjab, also known as City of Gardens. It is just 25 km away from the National Highway NH-1 (Delhi-Amritsar) at Rajpura Railway Junction. 250 km away from Delhi, 65 km from Chandigarh and 60 km from Ambala Cantt, Patiala is nestled amidst major cities. Nearest airport is Chandigarh. You can drive to Patiala from Chandigarh, via Zirakpur (on NH-22), and Rajpura. Patiala is well connected by train. One can take New Delhi-Bhatinda Inter City Express/Dadar Express or the Shatabdi Express to Ambala, and then hire a taxi to get to Patiala. February usually attracts more tourists, and is very pleasant in Patiala. 2019 © maakali All Rights Reserved.